Joint statement on the Marikana Massacre issued by the Tokologo Anarchist Collective, Zabalaza Anarchist Communist Front and Inkululeko Wits Anarchist Collective. Capitalists and politicians guilty! Stop police brutality. No justice, no peace. No Zuma, no Malema, no LONMIN! The Constitution promises political rights and equality. It is quite clear that the bosses and politicians do exactly as they wish. They walk on the faces of the people. 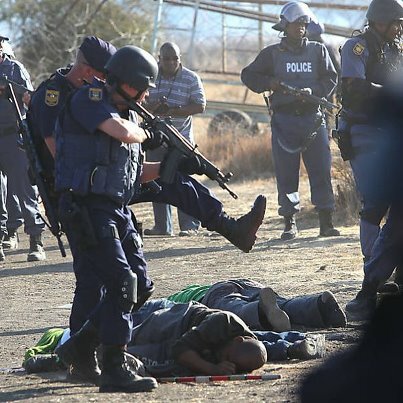 This is shown by the police killings of strikers at Lonmin’s Marikana mine. People! We must face the facts. The ANC government and the big capitalists run the show. The system makes the rich and powerful richer and more powerful. The workers and the poor suffer. We have no protection. You work, but you do not survive. Food prices are going up. ESKOM is going up. We must pay? With what? But when we struggle, we get shot. The state uses brutal force against the majority. We are marching, raising our grievances. This is our right. We must struggle to live. So, we fight against all elites: those who control government and those who control companies (like Lonmin). But our voices are silenced with bullets. While we do not agree uncritically with all the actions of the workers at Marikana, we are always with the working class and poor against the state and capitalists. The ANC promised to change the system. Instead, it became part of the system. Complaining against the National Party’s (NP’s) oppression, the ANC took office. The NP murdered workers. But now the ANC murders workers. The ANCYL has no grounds to pretend to condemn the police killings (see its Statement 17 August 2012). The ANCYL is part and parcel of the ruling ANC regime. Malema and other expelled ANCYL leaders also want to use these events to get reinstated into the ANC – to get rich or lie trying. But the ANC’s hands are dripping with blood. The past and present ANCYL leaders (like all ANC leaders) want more money, not more freedom for the people. Capitalism is a system of brutality and exploitation, of suffering. The black, Coloured and Indian working class suffers from the legacy of apartheid national oppression and from daily capitalist and police repression. (And even the white working class is exploited and oppressed). ANCYL uses the ANC murders to bang the drum again for ”the nationalisation of mines and other strategic sectors of the economy.” But Marikana shows the true nature of the state/ government, no matter what party: a bloodthirsty killing machine for the rich black and white ruling class. Real workers’ control of the economy does not mean private corporations (privatisation) or state corporations (nationalisation). It must mean real people’s democratic control of the economy through worker and community committees, serving people’s needs. The role of the police is to repress and silence the working class and poor. This problem cannot be fixed by commissions or enquiries – as some people think. Ask the family of Andries Tatane. It cannot be changed by elections. Remember: Sharpeville 1960, Soweto 1976, Uitenhague 1985, Michael Makhabane in 2000, SAMWU workers in 2009, Andries Tatane in 2011 … Marikana 2012. At least 25 protestors and strikers were killed from 2000, before Marikana. Look at Marikana. Elections do not change the system. Joining the government and becoming a politician is no solution. Replacing Jacob Zuma with another ANC leader is no solution. A new political party – even a “left” or “workers” party – is no solution. All the political parties are no solution. The Marikana unions, NUM and AMCU, have fallen into the trap set by the ruling class politicians and bosses. They fought each other, instead of fighting the real enemy. Unity is strength: do not be divided and ruled. Workers of the world unite! Working class of all countries and races unite! End the alliance! COSATU should have no links with the bloodstained ANC. It is time to replace the capitalist / state system with Counter Power by the people. This means that we want workers’/ community control of the economy, from below. We want democratic and direct self-management of industry by the workers in the workplaces; we want self- government of communities by those living in them. We want to collectively decide on how we run our lives. We refuse to live according to the rules determined by bosses and politicians, who use the police to shoot us like dogs when we disobey. ONE SOLUTION: WORKING CLASS DEMOCRACY ! WE NEED YOU! DON’T VOTE, MOBILISE! ‹ PreviousVenezuela and the ‘Bolivarian Revolution’: Beacon of Hope or Smoke and Mirrors?